Genetically Modified Organisms (GMOs) are constantly demonized by environmental activist groups as dangerous for public health or the environment. But the extensive scientific literature on GMOs simply doesn’t support these claims. 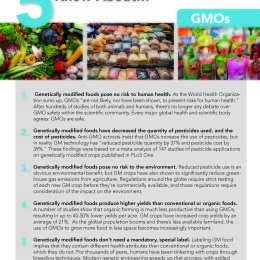 To learn the basics about GMOs and why labeling GMOs is unnecessary, check out our primer: 5 Things to Know about GMOs.